The World is full of different culture, society, and languages. We know that English is the most common language over the internet but there are many peoples from different countries don’t speak or understand the English. So, if you are writing in a blog or articles on WordPress website in an English or some other language then you are targeting just a specific group of peoples. But if you see the Google Analytics for your website, there is a large group audience come from some specific region such as France or Italy. Also, there are many peoples those want solutions in their own native language. Here is the WordPress plugin called Google Language Translate proves very handy. The plugin Google Language Translator gives a widget that can place on WordPress website. This Widget shows all languages and simply uses the Google Translate feature to translate. Yes, this plugin can translate the WordPress website but its comprehension level is not always good enough. But still it is very useful and here in this tutorial, we show you how to add Google Translate in WordPress. Here is the video: How To Translate WordPress Language using free Plugin Google Language Translate. Step 1: Go to your WordPress Dashboard and click on Plugin->Add new. Step 2: In the plugin keyword search box type “Google Language Translator” and it will show the Plugin. Step 3: Click on Install now and after installing click the Active option to activate the plugin. 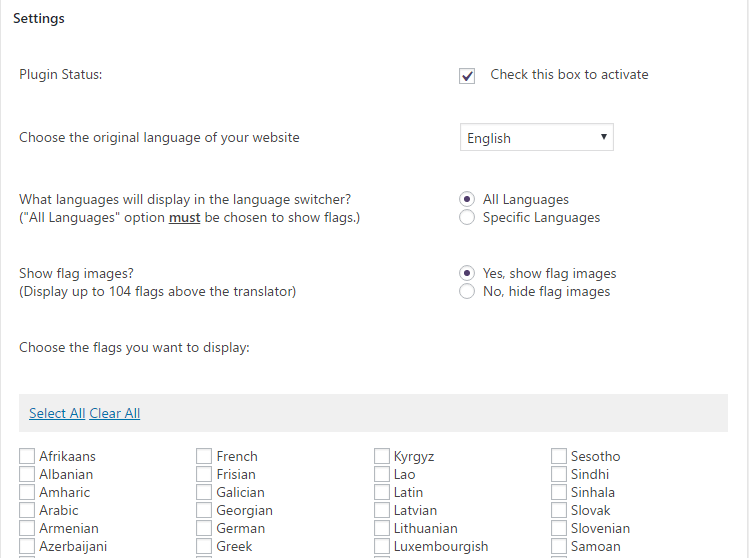 Step 4: Now go to Settings » Google Language Translator to setting up the plugin as per need. Step 5: First off check the Plugin Status box if it does not default. And after that select the default language of your WordPress website in which you are writing the articles. Step 6: The Next option you will see is the whether you want to show all languages to visitors or some selective languages. If you select all languages option, then it will show all languages as shown in the screenshot. 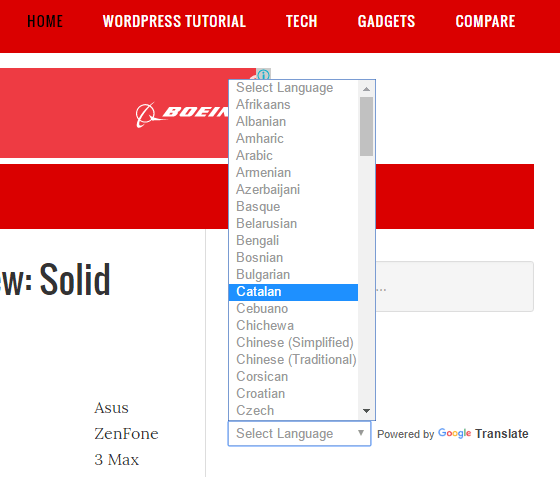 If you want to show some selective languages, then select the option “Specific Languages”. After selecting this it would show only choose languages as shown in the screenshot. Step 7: You can also check the Google Analytic option to track all the traffic which comes after translation. Step 8: Now it’s time setup the widget. Go to Appearance » Widgets and select the “Google Language Translator widget” and add or drag & drop to the blog’s sidebar where you want to show it. 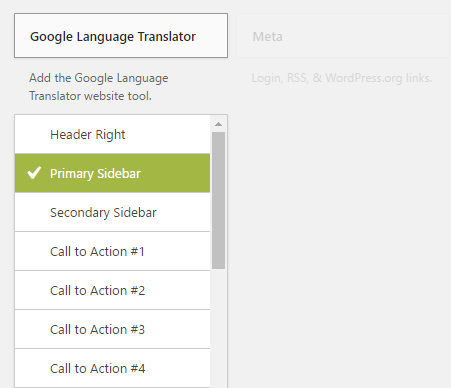 Step 9: Save your widget and visit your website to see the whether WordPress Google Language Translator is working or not. 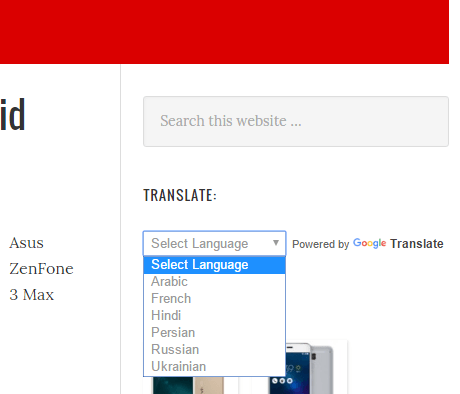 Step 10: At the side bar you will see a Translator option just click the drop down box and select some language to see the translation. You can see when we have selected the Russian language from the translate widget, the whole website text is translated to Russian. Google Translate will not only help your user to read the website content in their native or local language but also help them to translate whole website even the menus and other links. By default browser, Google chrome has the ability to add translation option when it detects different language on the website page but other browser doesn’t and here this plugin will help. If you have any questions related to Google Translation, please comment.